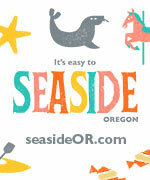 (Oregon Coast) – The ocean is one vast place, so it's no surprise there would be a bundle of surprises coming from it. There's a lot we don't know about in the deep, even off the Oregon coast. And sometimes some of that washes up onshore. (Photo: a lancetfish found in Pacific City by Seattle's Jeff Thirlwall). They are head-scratchers to downright shockers. A disgusting blob that's caused paranormal legends in ancient times. How can you tell if a sand dollar is still alive? And more. Here are four startling creatures that are sometimes found on these beaches. Live Sand Dollar vs. Dead. 99.9 percent of the time, if you find a sand dollar on the beach, it's dead. Usually, it's just a piece of one, actually. But on very rare occasions, you may find one still alive. (Photo above courtesy Tiffany Boothe, Seaside Aquarium). Tiffany Boothe of Seaside Aquarium said you normally see them all whitish or light gray, but they are a deeper gray to lavender when still alive. “The outside of their shell is covered with millions of tiny spines which look like 'fuzz' or hair,” she said. “These spines aid in the movement and feeding of the sand dollar.” (Photo courtesy Tiffany Boothe, Seaside Aquarium). This means if you find a sand dollar that is still fuzzy, you'll want to leave it alone. It's still alive. Grabbing one and putting it in your car will yield an unpleasant surprise: they stink really fast. Dolphins vs Porpoises. A common misunderstanding that happens around these parts is that people think they're seeing dolphins zipping around just offshore, when in fact it's a harbor porpoise. Harbor porpoises are extremely common in these waters, and their populations outnumber actual dolphins by about ten to one. But from afar – and even up close at times – they can look like dolphins. (Photo courtesy Tiffany Boothe, Seaside Aquarium). 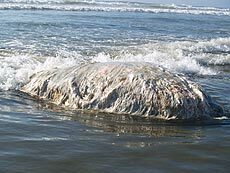 There are some kinds of dolphins that run around Oregon waters, but they rarely wash up onshore even after they've died. The three most common types are striped dolphins, white-sided dolphins and long-beaked common dolphins. Out of those, the striped dolphin has stranded ashore the most in the last ten years. Seaside Aquarium even found one still alive and tried to nurse it back to health several years ago. It did not work, however. The Disgusting Globster. There are ancient paranormal legends of mysterious creatures, akin to a sea monster, found on beaches. Sometimes called globsters, they are masses of surreal blobs with an absolutely puzzling skin texture and a horrible smell. (Photo courtesy Tiffany Boothe, Seaside Aquarium). It turns out, these infamous globsters are merely masses of decayed flesh from a whale, often not a whole body and just some weird, illogical shape. They are so badly decomposed their skin can look like fur. They don't turn up too often around here, but when they do, the folks from Seaside Aquarium have to respond to them as they do any whale stranding. But it's a disgusting job. “The last thing you want is that decomposed thing to roll over on you or just touch you, when it’s being knocked around by the tide,” said Boothe. Globster sightings have a bit of a cult following on the internet. The Wild, Weird Lancetfish. Another rarity to find on the shore is an odd, prehistoric looking fish called a Pacific Lancetfish. They are common in the waters of the Oregon coast, but it's rare to find one having washed up onshore. The lancetfish can have skin that appears iridescent, dagger-like teeth, along with striking blue eyes. Most people think they're looking at a barracuda, and they do resemble that with their enormous teeth. In fact, one that washed up on this shoreline in recent years may have died because they are known to accidentally bite themselves in a feeding frenzy.